This blog post is part 2 of a series of blogs on how to develop full-stack To-Do application in SAP Web IDE Full-Stack. Before reading this blog please make sure that you have read, understood and implemented part 0 and part 1 of this series. In our app we will use it for the OData provisioning. 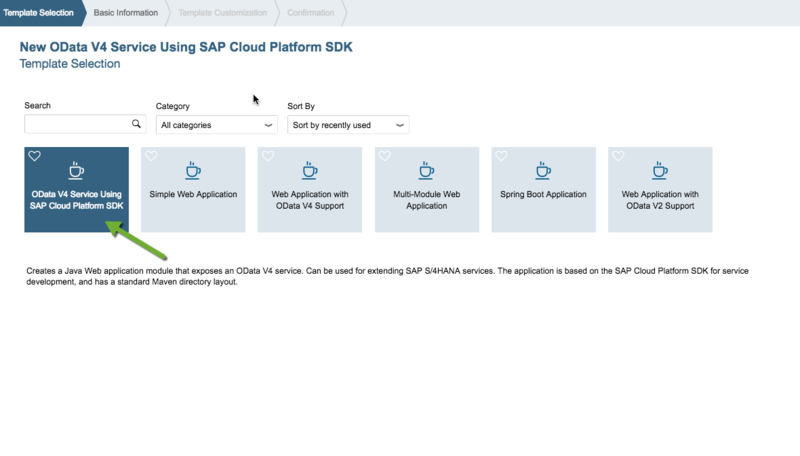 Select OData V4 Service Using SAP Cloud Platform SDK template and then click on Next. Enter service as the module name and click Next. Enter Group ID, artifact ID and package or just use the default values. 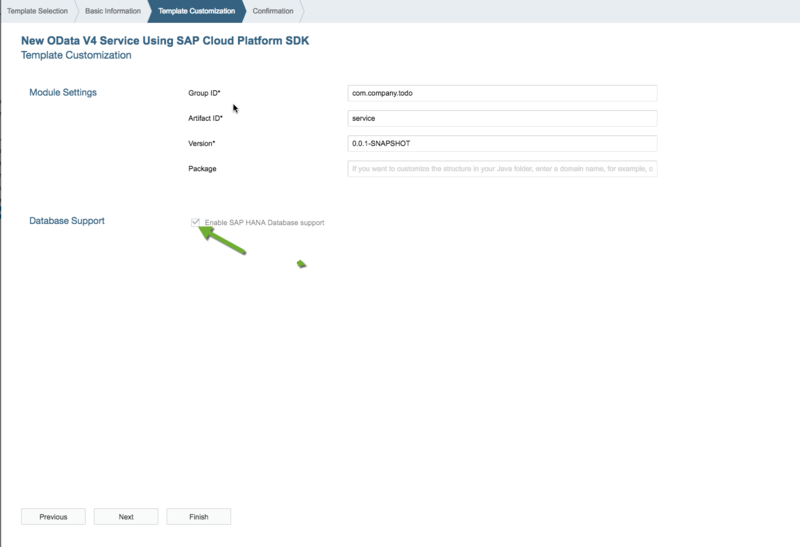 Make sure that Enable SAP HANA Database support checkbox is checked! It’s needed to allow connectivity from the Java service to the HANA database module. Finally, click Finish. 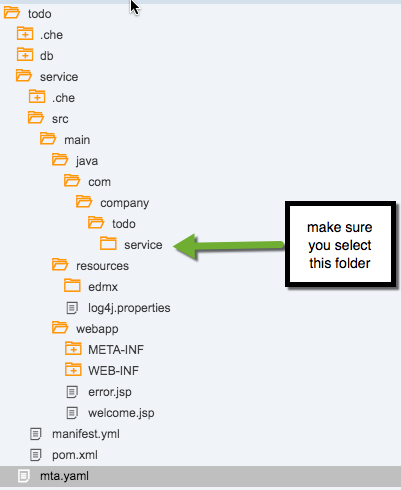 SAP Web IDE creates a new service folder under your todo project folder. 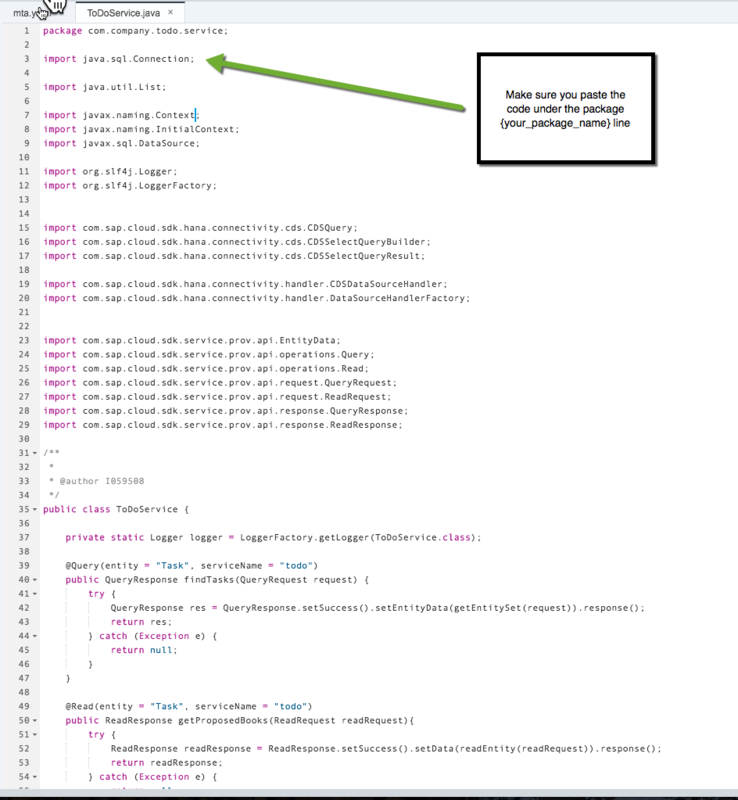 In addition, the mta.yaml file is updated and now contains the service java module in addition to the db module. Specifically notice the ‘provides’ and ‘requires’ sections in the mta.yaml file. 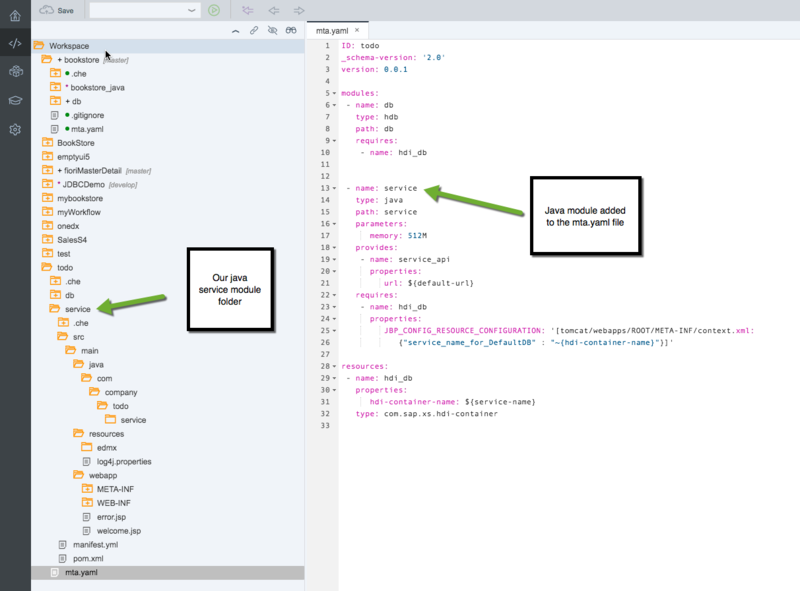 The db and java modules both require HANA and provides a service_api which will be used by the UI module (that we will create in part 3 of this series). 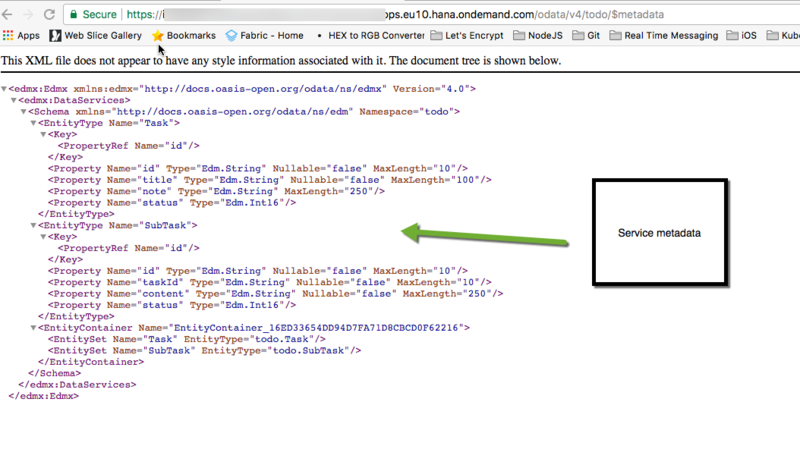 Uses the @Read and @Query annotations to expose a task and a list of tasks in OData. 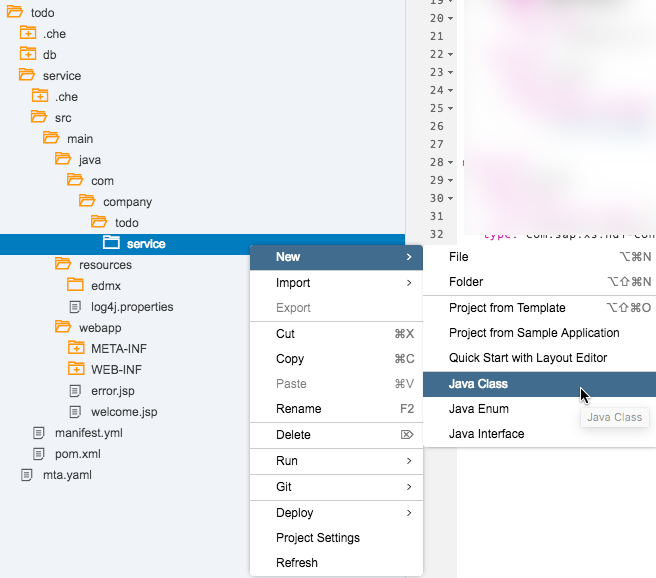 This is done using the SAP Cloud Java SDK which is added automatically by SAP Web IDE as a Maven dependency in the module (to understand more, review the pom.xml). Notice: This java code handles only the Task entity’s ‘query’ and ‘read’ operations. Handling the SubTask entity or any other CUD (create, update, delete) operations can be done in the same way (using the same SDK with similar code). Now let’s create the EDMX file for our OData V4 service metadata. Notice – in the future this file will be automatically generated by SAP Web IDE and so this step will not be required anymore. Moreover, the EDMX file must be OData V4 complaint and must contain the same entities, properties and associations that we have in the HDBCDS file that was created in part 1 of this series. For the purpose of this blog it’s sufficient to just copy and paste it into your project. Now that we created all the relevant resources for our java module, its time to build it. The build operation will execute a Maven build that will download all the dependencies and check that our java module is runnable. 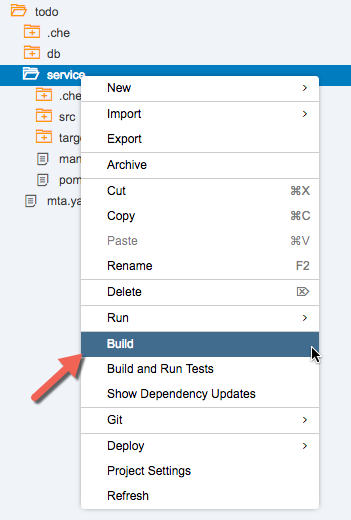 Logs and info about the build status can be found in SAP Web IDE console (can be opened via the View menu bar). The message Build of /todo/service completed successfully indicates that your project has been built successfully. Now we can run the service! In order to view the content of the OData service, open your browser and enter the URL together with /odata/v4/todo appended to it. This should present the OData service document. In part 3, we will show how to create the UI module that will consume this OData service. Our app will consume the service and show the lists of tasks in a Master section, and the task details in a Details section.